Every new technology goes through a honeymoon phase, where new technology X can now do Y and obsoletes all previous technology that used to do Y. Additive manufacturing (a.k.a., 3D printing) was no different, with predictions that soon practically everything from shoes to houses would be printed rather than made using traditional manufacturing techniques. And while 3D printing has moved in to mission-critical areas, such as medical implants and aviation, these efforts have come after significant investments in research & development (R&D) by large original equipment manufacturers (OEMs) to fully qualify the manufacturing process. For the rest of the world, there is a growing awareness that how a part is printed can have a significant impact on its performance in the real world. But coming across relevant public information is a challenge. Understanding this issue is critical for the wider utilization of 3D printing for industrial manufacturing. Thanks to decades of experience, manufacturers are well aware of the material properties used in part manufacturing, the tradeoffs of casting versus milling from solid stock, or benefits of one metal alloy versus another. Much study exists on how these material perform in different environments and applications, making it a relatively simple task for a manufacturer to select a material that meets their end requirements. For example, studies carried out by the Alliance for the Development of Additive Processing Technologies (ADAPT), have shown that varying the part orientation within the build volume can vary key mechanical properties by 30% or more — a variance not expected when using traditional techniques. Because of these issues, manufacturers need to take on the role of a material scientist in analyzing part performance based on these issues in addition to the role of engineer, needing to optimize both the topology and material of a part. Complicating this issue is that 3D printer manufacturers may not supply this type of information. Manufacturers are on their own in certifying a 3D manufacturing process for each application. Large companies have the financial resources and manpower to perform the testing needed to both qualify a manufacturing process and an individual part — resources that may be out of reach for smaller companies. Moreover, these same companies often rely on contract manufacturing to build parts; therefore, they do not have the right personnel to perform this work. While one solution is to not use 3D printing, there are an increasing number of parts that can only be constructed using 3D printing (complex manifolds being one example). So what is the solution for small companies needing to keep on the forefront of manufacturing technology, but lacking the necessary resources to ensure part performance? One solution is private/public partnerships composed of manufacturer and research facilities, chartered to collect and share data allowing members to benefit from collective knowledge. 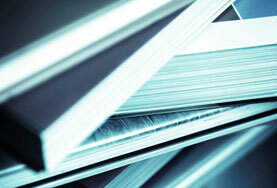 One such endeavor is the Alliance for the Development of Additive Processing Technologies (ADAPT). This membership-based organization is composed of Colorado manufactures in partnership with the Colorado School of Mines. Members gain access to two important features: the intelligent materials database and the advanced characterization center. This consortium gives its members access to pooled data and resources otherwise out of reach of individual companies. 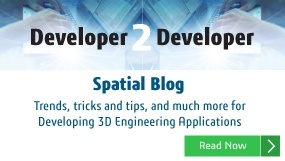 Learn more about Spatial Corp joining ADAPT. For an example, ADAPT carries out extensive testing of printed parts to understand how the way a part is printed and processed can affect its mechanical properties. This dog-bone sample test bed is a good example. 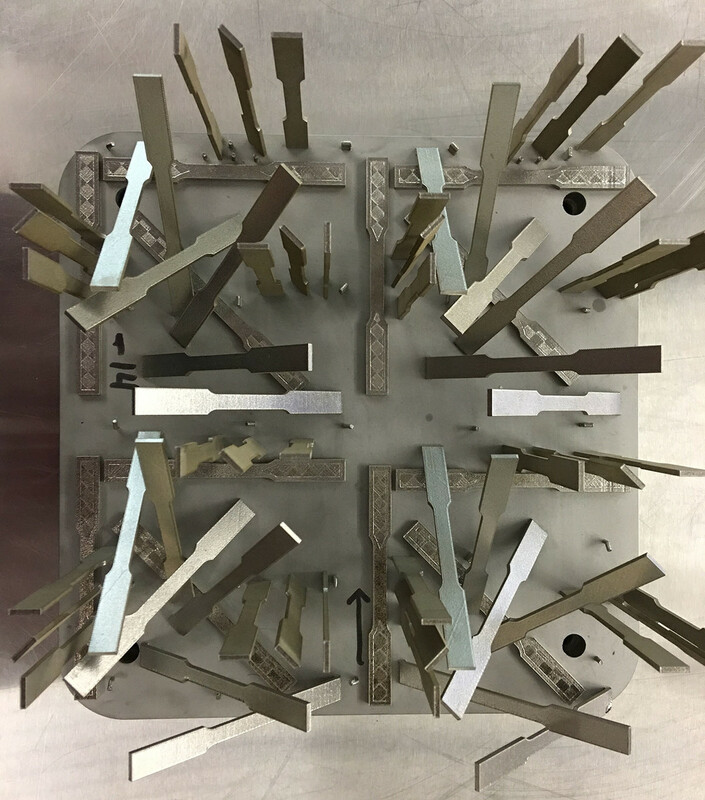 The collection of dog-bone shapes above is used to assess the effects of part orientation and location in the build volume on mechanical properties. The printed parts then undergo multiple analyses, include traditional mechanical testing, surface inspection, and advanced X-ray tomography. Together all these tests provide great insights to manufacturing variables not previously well understood. One example of the type of data that is made available to consortium members is shown in the graph below. 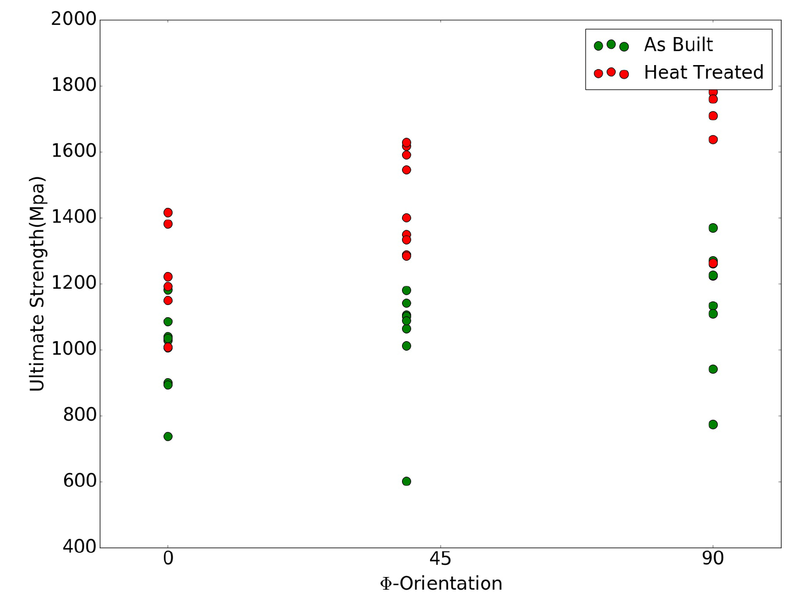 This data showes that the average ultimate strength of the samples (after heat treatment, the red dots) varies by approximately 30% based on the angle of the part in the build volume. In order for industrial additive manufacturing to become more widespread, additional data on the impact of materials and printing methods on part performance is desperately needed. Until this type of information is more widely available via 3D printer vendors and manufacturing software developers, consortiums such as ADAPT will be critical for industry growth.